As a child, Pogo was one of those comic strips that looked really funny but was hard for me to figure out. Sort of like Funky Winkerbean. But, then again, how could an 8-year old appreciate the social and politic satire of Walt Kelly? Kelly is an under-appreciated part of American cultural history who inspired many including Gary Trudeau of Doonesbury, Jim Henson, and Robert Crumb. The comic strip ran from 1949 until Kelly’s death in 1973. It features Pogo the Possum as the central character, the straight man, surrounded by a motley crew of colorful anthropomorphic animals each representing a recognizable aspect of the human condition. Kelly used his characters and wit to unmask the hypocrisy of political figures such as Joe McCarthy (renamed “Simple Malarkey”) and expose the dangers of the ultra-conservative John Birch Society (or “Jack Acid Society” — say it aloud a few times). His best known line is “we have seen the enemy and he is us”. 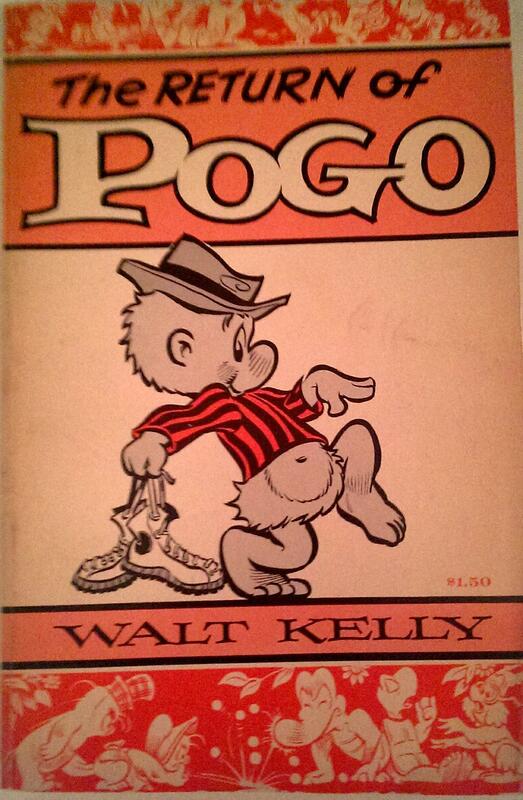 If you have never done so, read Pogo and learn more about Walt Kelly. His comics offer an entertaining walk-through of 20th century politics and social issues. 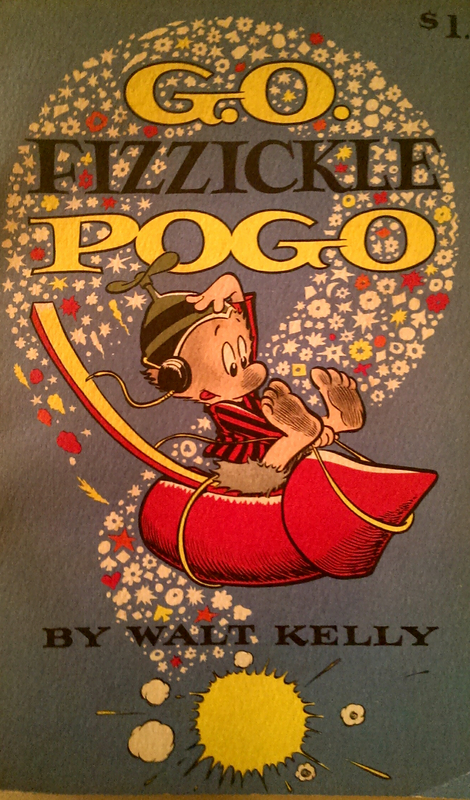 Before Olivia Newton-John, Pogo told us to Go Fizzickle. So what’s the connection to Lois Nettleton? Lois has at least seven Pogo books in her collection, likely acquired during her relationship with Jean Shepherd . Now, I’m not an expert on Shepherd. For expertise, you should check out this site. But there are parallels between Kelly and Shepherd — a subversive sense of humor and a genius for story-telling. Both were truly great humorists of the 20th century. There is also an interesting connection to the beat poets with whom Jean was friends. The back cover of one of the Pogo books makes this link. 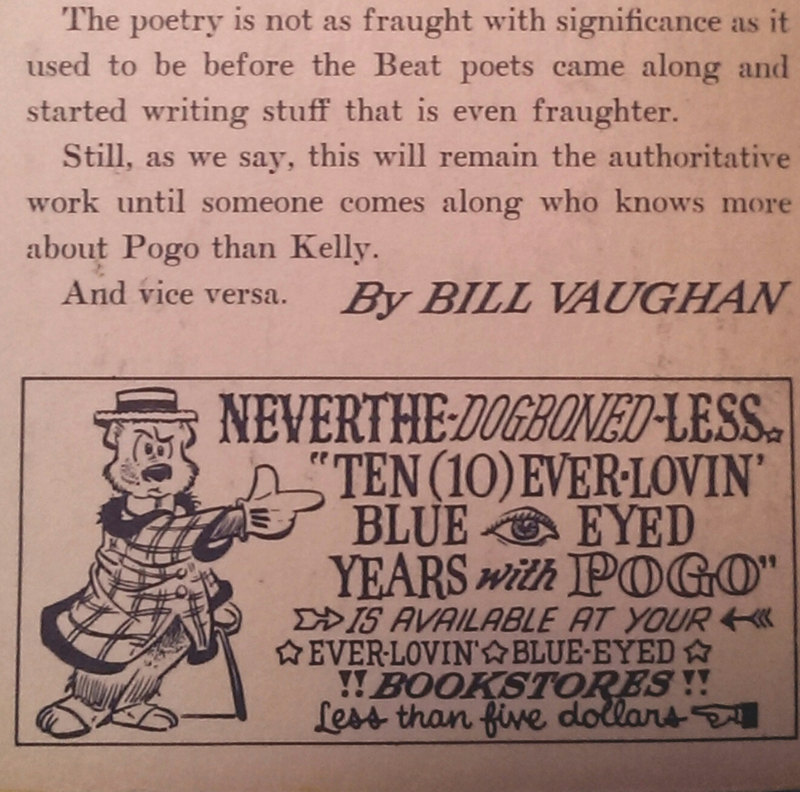 The Beat poets picked up where Walk Kelly left off — questioning authority and eschewing conformity. Here’s one other bit of Lois-Pogo trivia. Lois was good friends with the actress Dolores Hart, who famously dated Elvis and left Hollywood to become a nun. Lois and Mother Dolores remained friends until the end. During her starlet days, Dolores Hart owned a dog named Pogo. He is mentioned in Mother Dolores terrific new autobiography, The Ear of the Heart . Who knew? Many thanks to Eugene B. Bergmann’s (author of the excellent Excelsior, You Fathead! The Art and Enigma of Jean Shepherd) and Jim Clavin of flicklives.com for their encouragement and kind words. Both Eugene and Jim are great resources. Check them out. Until next time, stay cool. This book was selected for the inaugural post because it captures the 1962 zeitgeist and a bit of family history. As shown on the cover, the Village Voice Reader prominently features Jean Shepherd of WOR radio and “Christmas Story” fame. Jean was married to my aunt — the lovely and talented actress, Lois Nettleton. She was an avid reader– the walls of her NY apartment were lined with books on art, humor, and philosophy. Her collection provides a view into the intellectual and artistic climate of the 1950s, 1960s and 1970s. These books were bequeathed to me and are the subject of the blog. Many books in the collection, including this one, were acquired during her 1960-1967 marriage to Jean. When he first arrived in NY, Jean wrote for the Village Voice. According to wfmu.org, Jean Shepherd “evoked New York’s beat scene during the 1950s, spinning first-hand vignettes of Kerouac, Mingus, Feiffer and Ginsberg.” Quite the line-up. 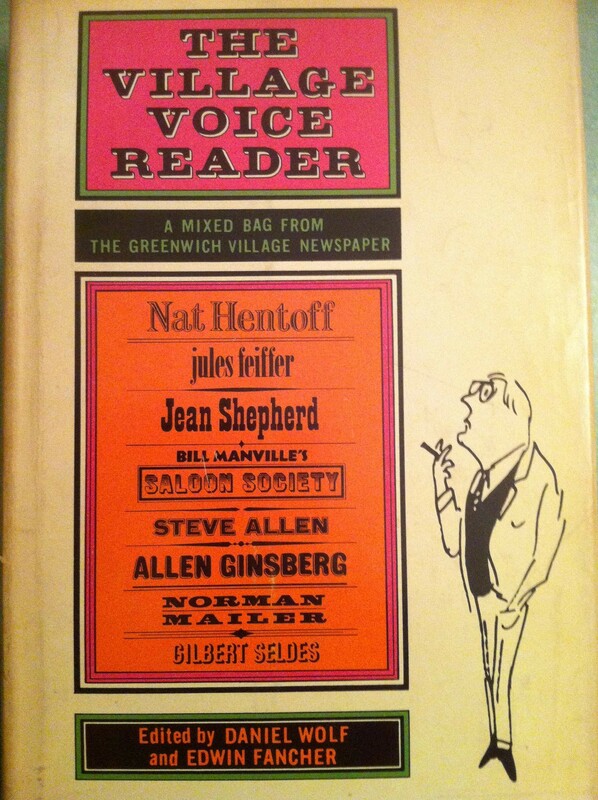 This first edition is a short story compilation featuring Jean and his Greenwich Village pals. It includes “The Hip and the Square” by Norman Mailer and the intriguing "The Hip Historian Knows a Man's Pad is His Castle' by Suzanne Kiplinger.
" As most people know, Greenwich Village is that way out, Bohemian section of America located somewhere in New York City where tourists, flock to gawk, teenagers crowd for kicks, and where everyone listens to poetry. "The Village" is beats and beards, arts and jazz, intellectuals and pseudo-intellectuals, the square, the hip, and the coffee houses. It is also a splendid residential district, a slum, an idea, a spirit, a fraud." This captures some of the magic I felt when Lois visited my family in our small NJ town when I was a child. She brought a bit of this fairy dust and excitement that I hoped would rub off on me. The book's language, design, and typography evoke warm memories of her and of the longing created in me for a life beyond suburbia. "In 1955 two young men, once a practicing psychologist and the other a scholar in philosophy, started an unorthodox weekly in Greenwich Village. of course, their background equipped them perfectly for newspaper publishing. The Voice was originally conceived as a living, breathing attempt to demolish the notion that one needs to be a professional or accomplish something in a field as purportedly technical as journalism. We wanted to jam the gears of creeping automatism. The newspaper succeeded." So the Village Voice was a father to the blogger, giving a platform to those outside the established media. The viewpoints expressed by the Voice rarely reflect my own, but props to the founding visionaries for understanding the human need for creative expression. And with that I close, grateful for the opportunity to share my voice with you. Hat tip to John Bowab for making this possible. Until next time.